At McWilliams Vision Care, we are pleased to offer a wide range of optometry services for our community! Our experienced optometrists can provide you with thorough eye evaluations, determine if you need corrective lenses and your exact prescription strength, fit you with the appropriate specialty eyewear, and help you pick out the most flattering pair of glasses for your face shape and skin tone. 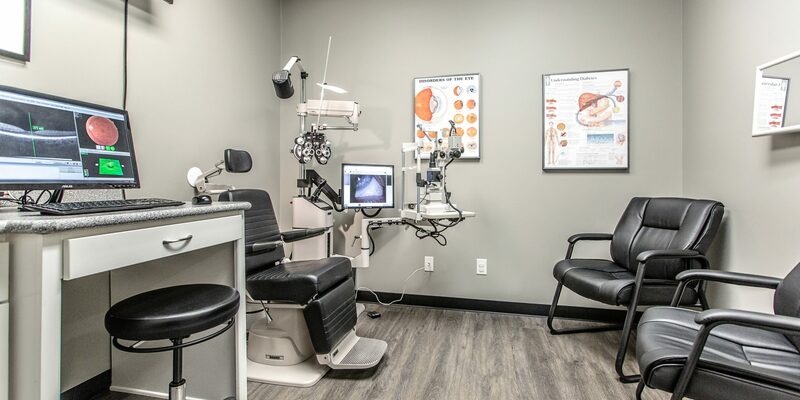 Our new patient appointments always begin with a comprehensive eye exam. If you are unsure of your family’s eye health history, it’s helpful to research beforehand, so we can better evaluate your own eye health. Visit our online patient center to view forms you can fill out before your appointment. If you have never had a comprehensive exam, don’t worry! All the tests and exercises are simple and painless. Our complete eye examinations are very thorough and allow us to recommend the best treatment and prescription for your eye needs. We start with some information about your health and eye history. Remember your eyes are connected to the rest of your body so many systemic issues can cause eye problems. Be sure and include all general health conditions in your history. You will then see our technician who will perform a series of preliminary tests to provide the doctor with some data to start your exam. Dr. McWilliams will analyze all this information, measure your prescription, and check the health of your eyes. She will then review all of your examination results with you to ensure you have a good understanding of your treatment and optical options that will provide you with your best vision. A contact lens evaluation is required each year to ensure a proper fit and prescription for each lens. This is done in addition to a comprehensive examination. We offer many in stock options for contact lens wear including daily wear, monthly wear, colors, and lenses for astigmatism. We’ll provide the proper lens wear modality and prescription based on your lifestyle needs. A backup pair of glasses is recommended for all contact lens wearers. We see children of all ages for routine and medical care. We recommend a first eye examination at 8-10 months of age, then at age 2-3, and again before starting kindergarten. Most children do not need glasses at this age, but we ensure proper eye health and development. Much of our learning is done through our eyes so we pay close attention to eye alignment and eye teaming to provide the best possible start to your child’s education. Children need not know any letters or numbers to ensure a complete examination.